A 'Sanplat' is a sanitation platform (a ground level slab covering a 3 metre pit) on which a light building is constructed to form a latrine. It offers improved sanitation by eliminating flies and smell, through air circulation. The addition of a chimney draws air currents into the structure and through the squat hole. Odours rise through the chimney and disperse. The structure of the toilet means that any flies attracted to the pit through the squat hole will try to escape by heading towards the strongest light source, which comes from the chimney. The flies exit is blocked by a wire mesh so the flies eventually die and fall back into the pit. The spiral structure prevents too much light entering the toilet while allowing a free flow of air. 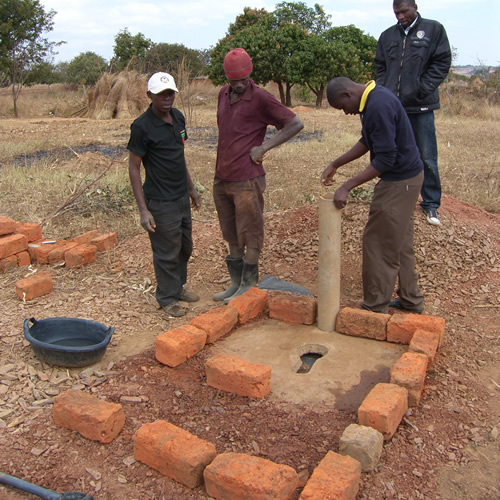 Water for kids have used Ventilated Improved Pit Latrines as the model most suited for most of the latrine projects. 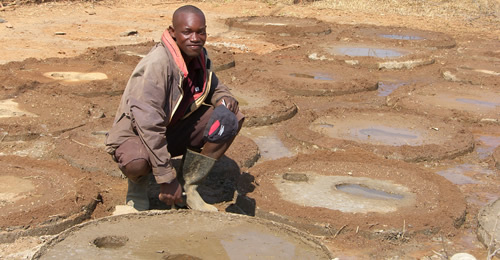 In the areas where the WfK projects are located, there is often little surface water. 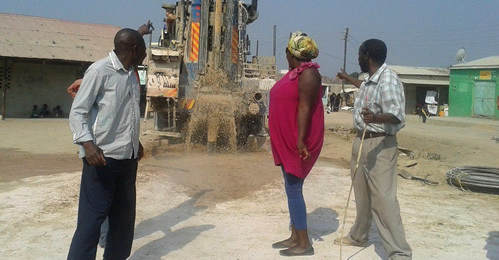 Boreholes are drilled in locations where sonar equipment indicated the rock is less dense, here water will collect at 45 to 90m below ground level. Pumps are then installed to bring water to the surface. 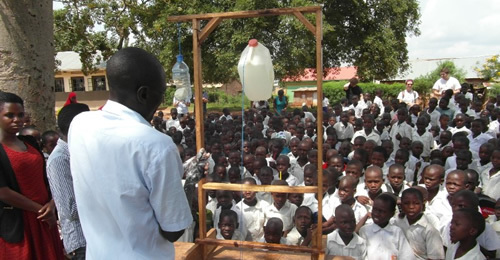 Most commonly hand pumps are used to draw the water up through the borehole to fill containers. 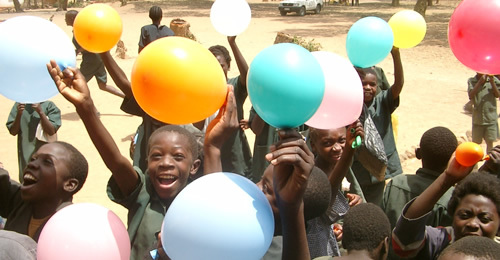 The cost of drilling a borehole and providing a hand pump varies from £2,000 to £8,000. So few boreholes can be provided and people often have to walk a long way to get water and may have to queue when they get there. This may mean they use contaminated surface wells or streams instead. Where there is scope to pipe the water to individual houses it is decided at the outset that water should be distributed from the borehole to taps within 250m of each house, the World Health Organisation (WHO) standard. This involves pumping the water to tanks, using solar power, where mains electricity is not available. The tanks are usually sited on stands 5 to 8 metres above the ground. The water is then gravity fed to taps. 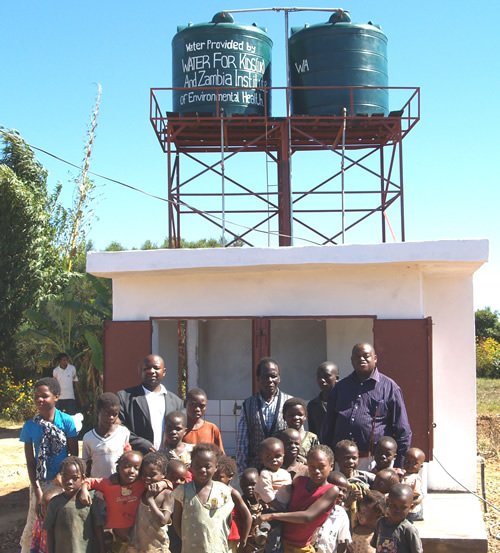 The Water Engineering and Development Centre at Loughborough University is one of the world's leading education and research institutes for improving access to infrastructure and services for the poor in low- and middle-income countries. More resources can be found at Practical Action.